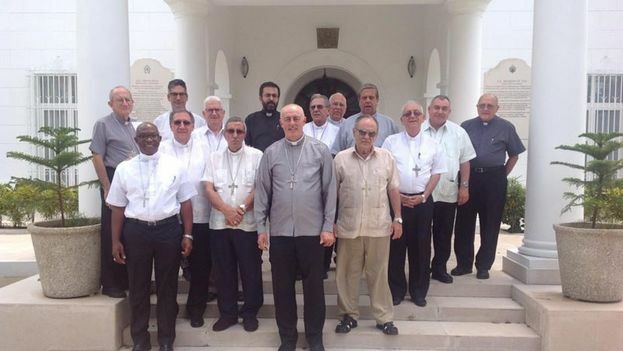 Cuban Bishops Lament that the Constitution Excludes "The Right To Plurality"
14ymedio, Havana, February 4, 2019 — Cuban bishops published a message this Sunday in which they criticize the new constitution, considering it to “exclude the effective exercise of the right to plurality of thought.” The constitution, which will be submitted to referendum on February 24, only recognizes “a single ideology,” the text points out. The prelates recall that José Martí defined a constitution as “a living and practical law that cannot be built with ideological elements” and call for plurality to be “safeguarded” in the constitution that will replace the current one, in force since 1976. The message of the Catholic prelates praises the fact that to Article 15, which states that “the Cuban state is secular,” has been written so that it respects “the right of each person to believe, live, and express the values that correspond to his faith.” However, they point out that that definition contradicts the preamble where “the absolute character of Marxist-Leninist ideology” is emphasized. One of the first actions taken by the revolutionary government after the arrival to power of Fidel Castro, in January of 1959, was the expropriation of the institutions that were administrated by different religious orders. Well-known on the island among them were the schools of the Brothers of La Salle and those run by the Marist brothers. For six decades, the state has maintained total control of primary, secondary, and university education, and officially Catholic schools and universities are not permitted. Cubans can only take courses for computer science, theology, graphic design, English, or business administration run by the island’s parishes. After Pope John Paul II’s visit to the island in January of 1998, authorities changed the constitution to change Cuba from an atheist state to a secular one, a gesture that opened the door to a greater religious liberty, after long years of atheistic intolerance, persecution, and punishment for the faithful. “We lament that there has not been substantial change regarding marriage and the family,” they add and also criticize that the new constitution does not recognize that “the family has an original and irreplaceable function in the education of children” which includes the power “to choose the type of education” that they will receive. This is the second message from the bishops about the constitution in fewer than four months. In the previous one, dated October 2018, they passed over several criticisms of the constitutional text that was still being drawn up. On that occasion the prelates emphasized that the constitution “must reflect the characteristics of society,” since it determines the life of citizens, their future, coexistence, and their “participation in the making of decisions” of the country.